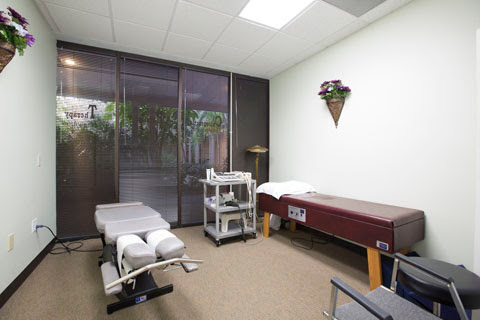 At Sarasota Chiropractic, Physical Therapy & Massage, we are proud to be manage pain with the natural healing approach. Whether you are suffering from back pain, shoulder pain, headaches, neck pain, arthritis, fibromyalgia, carpal tunnel, or any other pain causing condition, we can help. Our chiropractor in Sarasota, FL, Dr. Abe Kozma, is a Doctor of Chiropractic who has been providing pain relief for patients since 1999. We look for long term solutions, not short term fixes. We look for the problems, which are causing your pain and approach treatment with a combination of natural healing techniques. and other pain-causing conditions are often due to an imbalance in the spinal column. This is precisely the type of problem that chiropractic care is used for. For example, gentle spinal adjustments administered by our Sarasota chiropractors can revert the spine to correct alignment and bulged discs, and relieve the pain and pressure that such an injury can cause. Pain relief methods are not limited to chiropractic adjustments: We also offer a range of complementary treatments that can speed up healing times, reduce inflammation, and manage or even eliminate pain. Our pain relief methods include physiotherapy techniques such as cryotherapy, heat therapy, and muscle stimulation. These types of physiotherapy are often used before or after a spinal adjustment, with the goal of additional pain relief and relaxation. Many patients find the physiotherapy methods particularly enjoyable and relaxing. In some cases, Dr. Kozma will recommend massage therapy or acupuncture for additional pain in his patients. Massage therapy can be very helpful in lowering inflammation, relaxing muscles, and reducing pain. Acupuncture, which uses extremely thin needles in pressure points on the body, can reduce pain and inflammation in very specific areas of the body. We work closely with certified massage therapists and acupuncturists to craft the most effective pain relief plan possible for each patient. Dr. Kozma will perform a complete exam on each patient prior to starting treatment. After a discussion with the patient, the pain relief pain will be determined. No matter which of the pain management methods that are used, the goal is to first resolve specific problems, and then to help with total body wellness. For example, if a patient is having back pain problems, the initial focus will be on the area in the back causing the problems. However, over the course of the treatments, the entire body will begin to reap the wellness benefits of this type of natural healing. The patient is always first at Sarasota Chiropractic, Physical Therapy & Massage, and we will provide you with the most effective pain relief to prove that.